Our teams convert to defense after almost every offensive possession-other than dead ball turnovers. It is also much tougher to score against our set half court defense. That makes it important that we work at being very good in our conversion defense. Another aspect of conversion defense that I never practiced enough was converting after we miss (or make) a free throw. It happens a lot in games, but isn’t practiced enough, in my opinion. All of this information came from Coach Mike Neighbors, Arkansas women’s head coach. Drill begins with teams divided into two colors… Purple and White for the Huskies. They are lined up alternating colors in a line stretching toward half court. Allow two players from the defensive team to start near half court to simulate our FULLBACK and HALFBACK transition responsibilities. On the whistle the ball is tipped onto the glass with tipper going to back of line and next player keeping the tip going. When the ball is in hands of the offense coach blows whistle again (or yells shot). The offense goes in transition as the defense retreats. We go until we get transition stopped. As the season progresses allow offense to flow into action that you must defend as well. 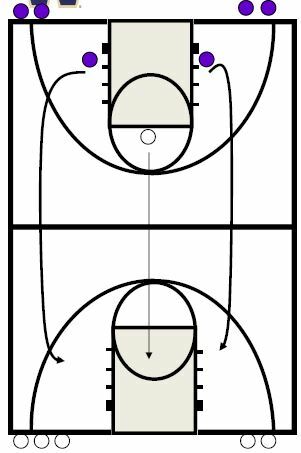 Change what you allow as the season goes to create variation and emphasis. We make the drill competitive by putting 4:00 on the clock. The clock runs during the time the ball is being tipped off the glass and is in live play. If the defense is successful in their efforts the clock stays on the time when the ball is stopped. For example, after first tipping it might be at 3:38. If the defense however is unsuccessful the clock is re-set to 4:00. This builds toughness. Players 1 and 2 are on defense. Players 3 and 4 are defenders. Coach has the ball. Tosses the ball to 3 or 4. 1 turns and SPRINTS back as the FULLBACK. 2 then must SPRINT back to get AHEAD of the BALL and try to slow the attack. 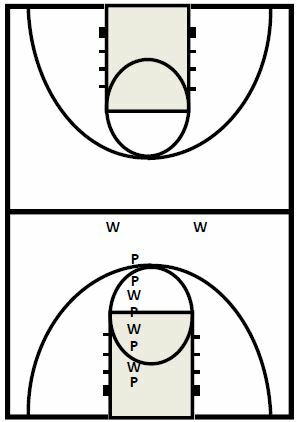 In diagram 2, we have added player 5 on offense and player 6 on defense to simulate 3-on-3 play. We will slowly begin to add players and manipulate the number of defenders to get the advantage/disadvantage situations in which we drill. To add to fun of the drill, after the coach passes the ball to the offense we will turn and using a blocking pad try to impede the progress of the last defender. 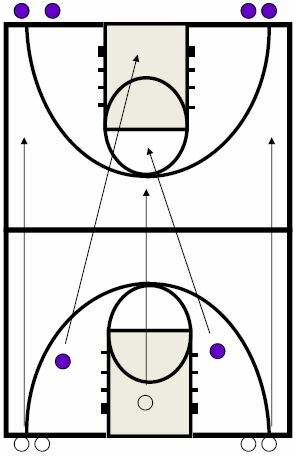 Great drill for teaching transition offense and defense simultaneously. Also stresses importance of making FT’s, taking advantage of “numbers” situations. Divide team into two colors. Try to get even number of guards and forwards if possible but not critical. 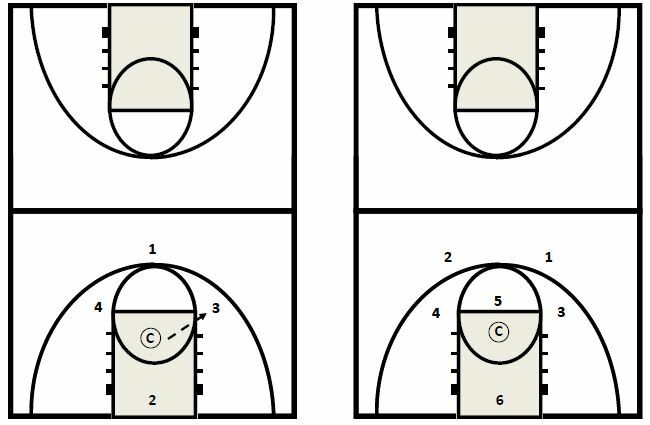 We score the drill as a normal game with 1s, 2s, and 3s. White team player a White team player attempts a FT. Two Blue defenders play the make/miss. The white player converts to defense. this possession then without stopping add TWO blue team players and they attack in a 4‐on‐3 situation… this continues until you have built it into a 5‐on‐5 situation. At the completion of the 5‐on‐5, start again with BLUE team player attempting a FT.